Born: 30 July 1854, Manchester, England. Died: 9 April 1920, Durban, South Africa. Maurice S. Evans, business man, politician and amateur botanist, was the eldest son of Edward Huddlestone Evans of Manchester, England. He came to Natal in 1875 and settled in Durban. His first scientific articles, "Plant fertilisation" and "Notes on some Natal plants", were published in Nature in 1876 and 1878 respectively. When the Natal Microscopical Society was formed in April that year he became a member of its first committee and was re-elected the next year. In November 1878 he read a paper on "Pollen" before the society, which was published as a pamphlet. It included brief descriptions of the pollen of about 50 plant species, both indigenous and exotic, and was well received by members as well as the society's correspondents in Britain. In 1885 he became a member of the first committee of the planned Durban Natural History Museum and was still serving in 1892. After a visit to the Royal Botanical Gardens at Kew, London, during 1893 he returned full of enthusiasm for botany and was particularly interested in the flora of the Drakensberg. In 1894 he explored the headwaters of the Bushmans River, between Cathkin Peak and Giants Castle at an altitude of 2000 to 3000 m, collecting plants and searching for cave sites. From this time to 1897 he contributed some 800 specimens from Natal and Zululand to the Natal Herbarium. In August 1894 he delivered a lecture on "The fertilisation of flowers with some illustrations from the Natal flora", which was published in Durban. It was followed by a paper on "The fertilisation of Loranthus kraussianus and L. dregei", published in Nature the next year. Around that time Evans suggested to John M. Wood*, director of the Natal Herbarium, that the latter should compile a Natal flora. The result was a six volume work, Natal Plants, published from 1899 to 1912. Evans co-authored the first volume and guaranteed it financially. He was also co-author with Wood of a paper on "New Natal plants. Decade II", published in the Journal of Botany (1897). In the preface to Vol. 6 (1897) of the Flora Capensis the editor, W.T. Thiselton-Dyer* thanked him for plant collections "which, although not large, have proved very rich in new species" (p. x). Three plant species were named after him: Kniphofia evansii, Sebaea evansii and Senecio evansii. Evans was a Fellow of the Zoological Society of London, a Fellow of the Royal Geographical Society, and was honoured by Britain as a Companion of the Order of St Michael and St George (CMG). In 1896 he became a member of the South African Philosophical Society and remained a member of its successor, the Royal Society of South Africa, to his death. In 1910 he was elected joint vice-president of the newly established (but short-lived) Natal Scientific Society and in 1916/7 became a foundation member of the South African Biological Society. 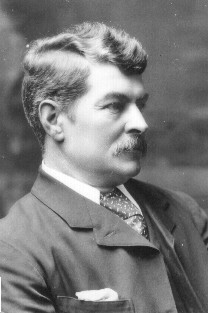 Evans was elected a member of the Legislative Assembly of Natal in 1897 and returned as member of parliament for Durban in 1906. He also served on the Durban town council in 1897 and 1898, but did not entirely give up his scientific interests. For example, he was treasurer of the Durban Botanic Society during at least the last three years of the century. In 1909 he supported the University College Bill in the Legislative Assembly; it became Act 18 of 1909 and provided for the founding of a university college in Pietermaritzburg. He was a member of many government commissions but his main political interest was in race relations and the native population of the colony. This resulted in his appointment as under secretary for native affairs and a member of the Council for Native Affairs, as well as a number of publications, among them The native problem in Natal (Durban, 1906); Black and white in South East Africa: A study in sociology (London, 1911); and Black and white in the southern states: A study of the race problem in the United States from a South African point of view (London, 1915). His interest extended to aspects of the anthropology and archaeology of KwaZulu-Natal. For example, in 1910 he wrote a paper, "Early man in Western Europe and South Africa", published in The Naturalist, in which he mentioned stone implements found at Mariannhill. The next year his contribution on "Cave hunting in the Drakensberg" (originally published in 1905) appeared in the Natal descriptive guide and official handbook, in which he discussed, among others, the former presence of Bushmen in the Drakensberg and the cave paintings they left behind. In 1916 he was president of Section D (Anthropology, ethnology, etc.) of the South African Association for the Advancement of Science, which he had joined in 1905, and delivered his presidential address on "A survey of the past and present relations of the European and Bantu races in Natal and surrounding territories". He delivered two more papers on native affairs at the 1918 meeting and still served on the association's council for 1918/9. Evans married Elizabeth Fairweather Murray in 1886. Durban Botanic Society. Report for 1897. (Don Africana Library, Durban). Henderson, W.P.M. Durban: Fifty years municipal history (pp. 378-384). Durban: Robinson & Co., 1904. Maguire, R. A history of Middle and Late Stone Age research in the KwaZulu-Natal coastal area from 1871 to the beginning of the second World War. In J.A. van Schalkwyk (ed. ), Studies in honour of professor J.F. Eloff. Pretoria: National Cultural History Museum, 1997. Natal almanac and yearly register, 1898, 1899: Durban Botanic Society. Natal Colonist, 23 November 1878, p. 3, "Natal Microscopical Society". The Natal who's who. Durban: Natal Who's Who Publishing Co., 1906. National Automated Archival Information Retrieval System (NAAIRS). http://www.national.archives.gov.za/naairs.htm Documents relating to Evans, Maurice Smethurst / Evans, Maurice S.
The Naturalist, 1911, Vol. 1, Numbers 3, 5 and 6: Council of the Natal Scientific Society. Plug, C. The Natal Microscopical Society (1878-1885?). Natalia, 1992, Vol. 22, pp. 49-54. Royal Society of South Africa. Transactions, 1910, Vol. 1; 1917, Vol. 6: Lists of members. Schrire, B.D. Centenary of the Natal Herbarium, Durban, 1882-1982. Bothalia, 1983, Vol. 14, pp. 223-236. South African Association for the Advancement of Science. Report, 1905/6, 1910, 1916, 1918. South African Journal of Natural History, Vol. 1(1), pp. 8-15: Roll of Foundation Members [of the SA Biological Society]. South African Philosophical Society. Transactions, 1896-1907, Vol. 9-17, lists of members. Wyley, C. A bibliography of contemporary writings on the natural history of Natal and Zululand in the 19th and early 20th centuries. Journal of Natal and Zulu history, 1990/1, Vol. 13, pp. 91-110.